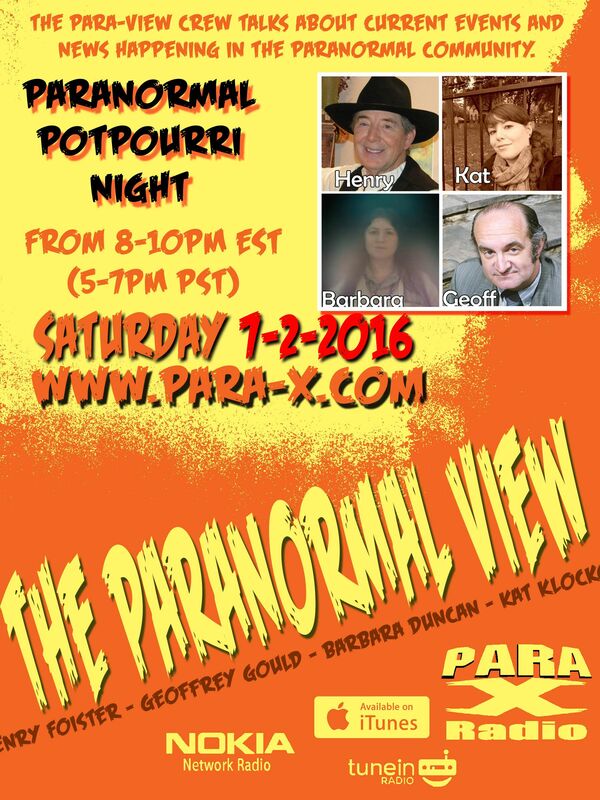 02 July 2016 "The Paranormal View"
Henry started the show, as we had no guest tonight. He began with the Goatman urban legend. He added a quick reference to a hoaxed Loch Ness monster skeleton. Kat indicated having a ton of information. She started on Ghost Hunters leaving the Sci-Fi Channel. She wanted to focus on how the Ghost Hunters show made on an impact on paranormal investigating community, even such things as paraormal tourism, even the existance of The Paranormal View. Kat spoke about earl online paranormal radio shows. I'd mentioned the evolution into YouTube webseries, such as Stacy and Andrew's brief LA Paranormal webisode series, twice on which I was a guest investigator, a Linda Vista episode and their Colorado Street Bridge. investigation. Kat wondered when we eac started Ghost Hunting ourselves. Kat spoke about Jeff Belanger's Legend Trips investigations, such as the Murdock-Whitney House and Isaac Morse House in Winchendon, Massachusetts, in which Kat would be participating. Henry reported a relatively well know story about baseball player John Grey who also does paranormal investigations. After the second break, Ceiling Cat Barbara Duncan reported out having listenres in the US, Canada, theUK, singapore, and Unknown. Henry read out the Leading Physicists Confirm that Parallel Worlds Exist article I'd posted on the Facebook page earlier that day. Kat and CC mentioned how NASA recently released thousands of photos taken from the moon to disprove those believing the moon landings were faked; she also made a quick reference to the Dogman site. Henry conveyed our guest next week would be Ken DeCosta of Riseup Paranormal [Rhode Island Society for the Examination of Unusual Phenomena].